Xoconostle has to be one of the coolest words out there: Pronounced show-co-NOST-lee, it comes from an Aztec word meaning “sour prickly pear fruit.” Which, well, it what it is. Xoconostle is a cousin of the normal prickly pear; same genus, different species. Officially it’s Opuntia matudae. It is native to Central Mexico, but I’ve seen it here in Northern California as well as Arizona. So far as I know, however, these would have been planted by someone. Xoconostle does not occur naturally in the United States. For the most part, xoconostle fruits, also called tuna agria, are green. Sometimes they have a pretty peachy glow to them, though. 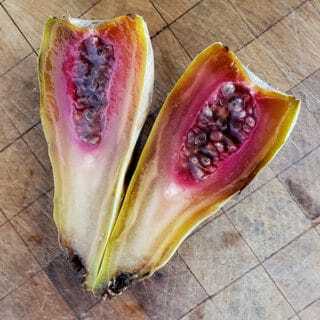 Nothing like the electric magenta of a good prickly pear. 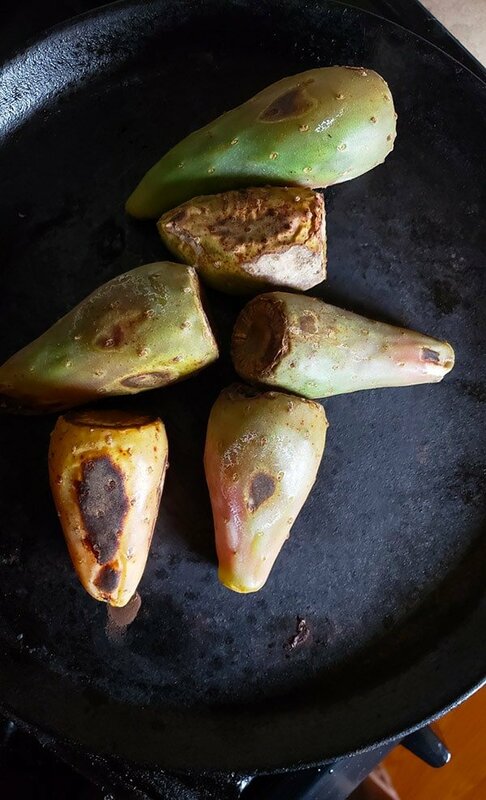 Salsa de xoconostle is the most common way to eat this fruit, which is increasingly available in Mexican markets in the US. I found these at La Esperanza Market in Sacramento. I commonly see two kinds of xoconostle salsa: A variant on pico de gallo, and this smooth salsa, which I like better. Other than the xoconostles, which can be hard to find, this salsa is super easy: dried chiles, onion, garlic, salt. What makes the salsa great is how you deal with all these ingredients. You roast them on a comal or in a cast iron or other heavy pan. Yep, you put the fruits right on the hot iron to char and heat up, then you let them steam in a plastic bag the same way you do when you char chiles to peel them. Same goes for the chiles, onion and garlic. What chiles to use? I prefer chile morita, which are a smaller, fruitier, slightly less smoky kind of chipotle. Like a chipotle, they are ripe, red jalapenos smoke-dried. You can, of course, use any of a variety of chiles. 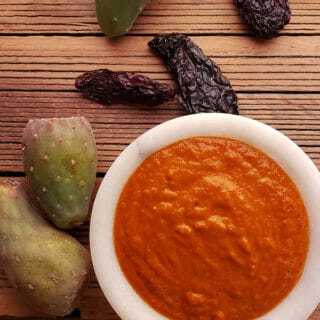 Some good alternatives, in order of preference, would be: chipotles; chile mixe, the smoky-spicy Oaxacan pasilla; toasted arbols; cascabels; chile puya; or, barring all else, plain ole’ guajillos. All of these chiles are dried. In a pinch you can use canned chipotles in adobo. There is no substitute for the xoconostle, however. It’s its own thing. 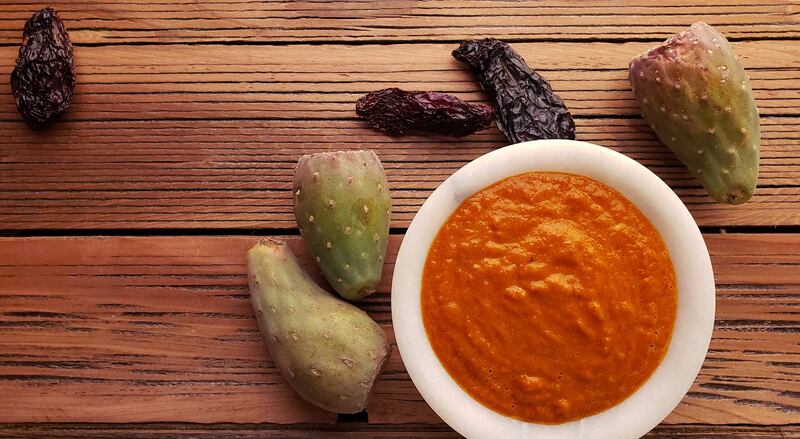 The resulting salsa de xoconostle is smoky, spicy, smooth, luscious and tart. It is fantastic for tortilla chips, and I loved it spread on a plate alongside seared fish. 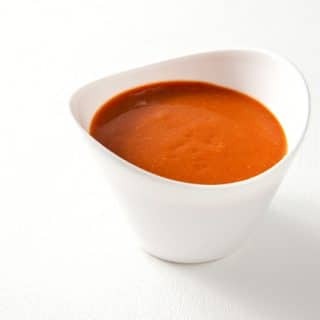 I like it pourable but thick, but if you want a thinner salsa, just add water. 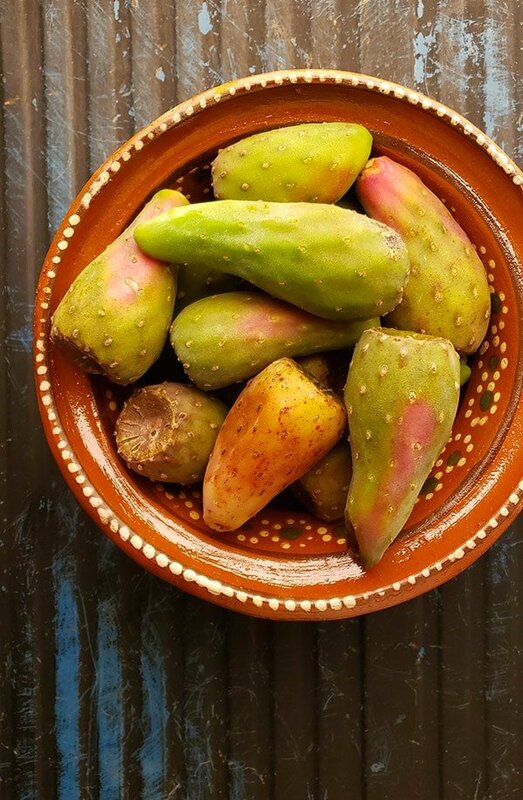 You can also see xoconostle in Central Mexican mole de olla, as well as sometimes in sorbet and in salads. I like it pureed into a vinaigrette for Mexican salads. This salsa highlights the tart xoconostle fruit, and alas, there is no substitute. Look for them in Mexican markets. Heat a comal or skillet or heavy frying pan over medium-high heat for a few minutes. When it's hot, set the xoconostles on the comal to char a bit. Set the onions down so flat sides are touching the comal. Put the garlic cloves around the edges of the pan. 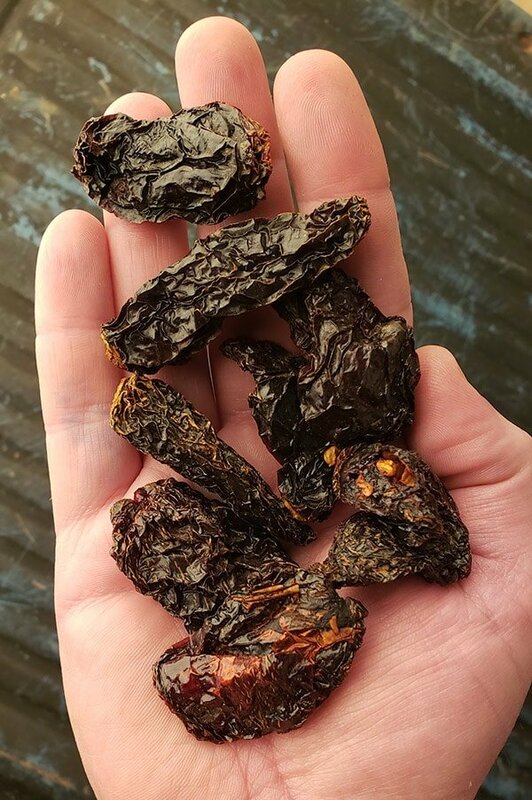 If there is any space left on the comal or pan, toast the dried chiles for about 90 seconds, turning them every 15 seconds or so so they do not burn. When the chiles are toasted, set them in a bowl and pour boiling water over them just to cover, about 2 cups. Cover the bowl and set aside. Keep turning and charring the xoconostles, onions and garlic until you get some nice blackening. Remove from the heat. Put the xoconostles in a plastic bag to steam for 15 minutes. Roughly chop the onion and put in a blender. Peel the garlic, roughly chop it and put that in the blender. Remove the chiles from the water, chop and add to the blender. Save the soaking water. Slice the xoconostles in half. Scoop out the seeds. Ideally, you set all the seeds in a strainer set over a small bowl to catch any juices. Use a spoon to scoop out the fruit. It helps to slice off the flat top of the xoconostle first. Discard the skin. Add all this to the blender. Puree the salsa and add salt to taste. This salsa will keep for at least a week in the fridge. You can find all sorts of salsas and other sauces for fish and game here on Hunter Angler Gardener Cook! Alan: Most states require washing before selling, which removes most pesticide residue. I know in California there are state inspectors who spot check produce. Not sure about other states.